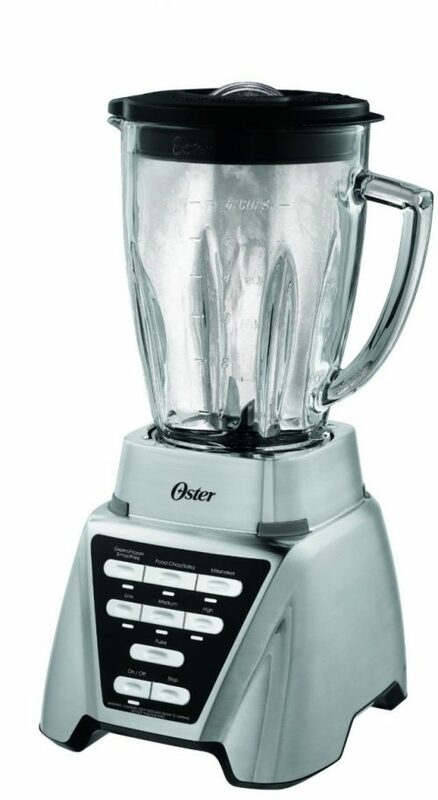 Today I’m going to review Oster Pro 1200 blender. The Oster brand has been around for a few decades and no wonder their products are always best sellers in Amazon. Besides making quality product, they also sell it cheaply perfect for those just want to try to make their own smoothie. The Oster Pro 1200 Blender sells at a really great price on Amazon and for such a quality product, you definitely won’t regret it. 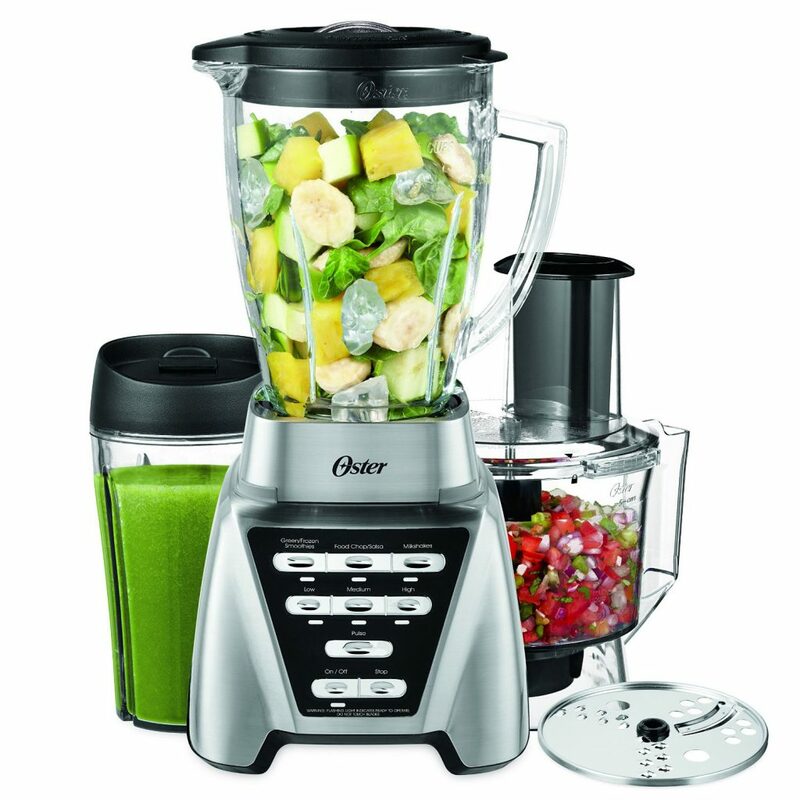 Oster Pro 1200 is a versatile blender package. It comes with a glass pitcher, a personal cup and also a food processor (you can also buy the blender without this). The 1200 watt motor is guaranteed to pulverize everything you put in there. Be it ice, green leafy vegetables, seeds, nuts etc. 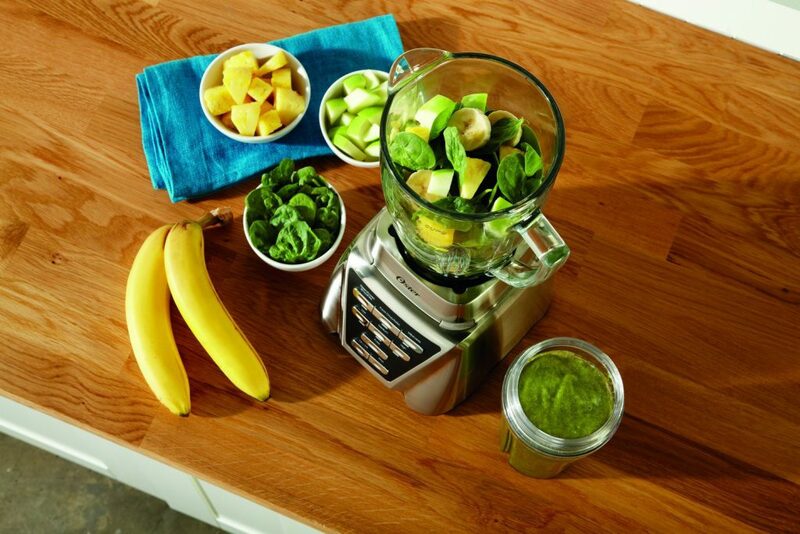 The high powered motor will reduce all of the ingredients to smooth textured fluid, perfect for your morning smoothie. 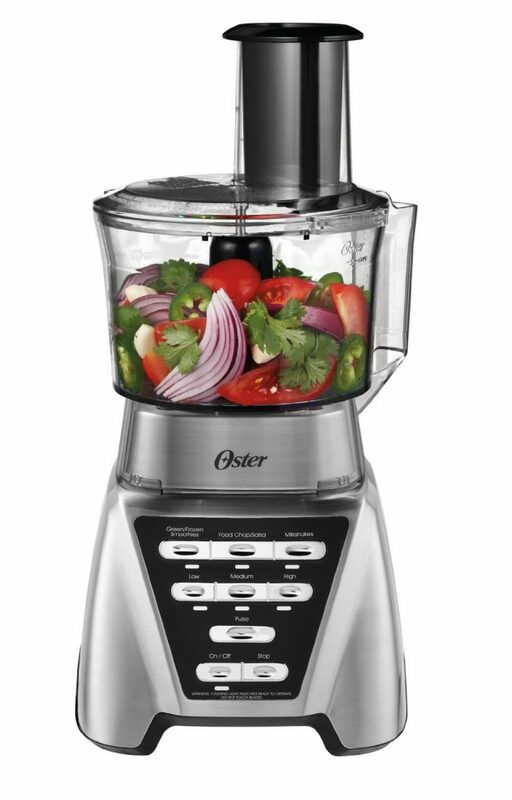 Oster also has developed a dual direction blade technology to be used in this blender. This technology will automatically change the direction the blade rotate for a few times at the start of the blending (only for the pre-programmed settings). This will undoubtedly help with crushing the hard materials at the initial blending stage. The blender also comes with a 3.5 inches wide blade with a wide base. The blade is 50% larger than other blenders (of the same price). What this do is it will help more ingredients to be flow and be in contact with the blade ensuring to give you the best smoothie every time. This is a video demonstrating on how to make a smoothie using Oster Pro 1200. Credit to helpfulnatural. This blender is also very versatile. It comes with a personal cup and also food processor. The personal cup is perfect for those who don’t have enough time to clean their blender. Just put your ingredients into the cup, attach to the blender, blend, take out the cup, put in the cup cover and you are ready to go. No need to clean the blender afterwards. Oster Pro 1200 can be easily converted into a personal blender by attaching the personal cup. Perfect for those morning rush hours when you just want to make your morning smoothie and sip it on the way to work! The food processor is designed to help with chopping and slicing vegetables and fruits for salsa, salad etc. If you are living alone and not really into cooking, I would suggest you to not buy this (it comes as an option. you can buy the blender + personal cup only for $20 lesser). But if you are the type to regularly throw a party or dinner, then this will surely come in handy. It will make preparing vegetables in large quantities a breeze! Just plug the food processor attachment to the blender and you are ready to go. The third mode of this multi-function blender is food processor mode. Attach the food processor cup and dice your salsa and salad away! Oster Pro 1200 also comes with 10-year warranty for its All Metal Drive, and 3-year warranty for other parts. This long warranty period just shows how they stand by their product. Not many blender makers can give such extended warranty and 10 years is really a long time. If you are looking for a high performance blender that is also cheap, you are currently looking at it. Oster Pro 1200 is one of the best bang for your buck. Milk shake, smoothie, even peanut butter can be prepared flawlessly using this blender. There is a personal cup for you who are always in the rush. The addition of food processor just makes it more versatile. Lastly, rest assured that you are well covered by Oster’s 10-year warranty (for its metal drive) and 3-year warranty (for other parts). Previous Post: How To Lower Cholesterol Using Smoothies? I like this blender and the way you have mentioned the features I think it is perfect for me, I really liked the fact that it comes with a three years warranty. What is the size of the glass pitcher? And does the company come with various sizes of pitchers? Hi Shrey! Thank you for reading and I’m glad you like it. The glass pitcher has a capacity of 6 cups or 48 oz. There is only one pitcher size though you can always use the personal cup (24 oz) that comes with it to make your smoothie too. This is an incredible blender. I purchased mine from target. It has fueled through intense greens like kale and Swiss chard, (with stems), and in addition solidified natural product, nuts and seeds. It additionally makes wonderful salsa and nut spreads. I likewise claim a Vitamix however needed to make tracks in an opposite direction from the plastic compartment. In spite of the fact that these 2 blenders are not in the same power/engine classification, the Oster Pro is very noteworthy in what it can do. I adore the switching sharp edge activity with the smoothie and salsa capacities. It truly keeps things moving without stopping the blender to redistribute everything. What truly sold me on this blender was the point at which I made almond spread in it. In the wake of making it in both my Vitamix and nourishment processor, both of which carry out the employment however turn out to be extremely hot amid the mixing which I don’t need in a plastic vessel. It can likewise be fairly tedious because of the thickness of the margarine. This Oster took just 10 minutes all the way including the occasional stop to rub down the pitcher. My almond margarine was smooth, luxurious and spreadable without being warmed up from the rubbing of the cutting edges. I discovered utilizing the medium mix setting to work impeccably for this. I was mooched to need to supplant my Vitamix since the organization doesn’t have all the earmarks of being in any rush to offer an option compartment to the plastic, in spite of the numerous solicitations from their clients. I considered the Waring all stainless steel compartment that fits the Vitamix base, however it has its own issues: 1. It’s costly! $300. 2. It has PTFE (Teflon) chips that filter out from under the sharp edge get together and into your sustenance. In any case, this Oster is addressing my needs to say the very least. I likewise adore that new parts are effectively open and cheap. The glass compartment is thick and tough and, dissimilar to plastic, it tidies up wonderfully and effectively. Not any more collected smells and stains, in spite of the majority of my scouring, splashing and flushing! Furthermore, one minor thing….it fits under my cupboards completely gathered. In conclusion, I too had the issue with it moving over the ledge when on fast. As it turned out, I was missing one of the little elastic feet on the base. I called the Oster organization and they sent me a substitution that was conveyed via mail 4 days after the fact. Issue comprehended! Awesome client benefit! Very prescribed! Hi Carlton! It’s very nice to hear your great feedback on the Oster Pro 1200 blender. I truly agree with you. This blender is one of the best if what we are looking is a blender for home use. And the best part is that it is not very expensive! Your experience with Oster’s customer support is a very useful information for those still considering to buy the blender. Many thanks Carlton!